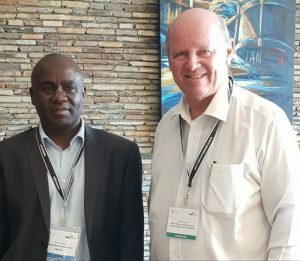 Kampala (Uganda) – July 19, 2018 (travelindex.com) – Dr Wasswa Tom Davis, a Board Member of the Uganda Tourism Board and Manager for Marketing & Commercial Services at the Uganda Civil Aviation Authority and Alain St.Ange, Head of the Saint Ange Tourism Consultancy took the opportunity to meet to discuss potential avenue of cooperation as they sat in Accra Ghana for Routes Africa 2018. Dr Wasswa Tom Davis and St.Ange has previously met in Kampala in Uganda when the Seychelles former Minister for Tourism, Civil Aviation, Ports and Marine delivered the Key Note Address at the East Africa Tourism Platform meeting as part of his then campaign for the post of Secretary General of the UNWTO. Alain St.Ange is today working with Tourism Boards, Tourism Ministries and Tourism Private Sector Businesses especially in the field of visibility campaigns to ensure relevance in the competitive world of tourism. He is also a regular speaker at Tourism and Aviation events where he refers to his successes at the head of Seychelles Tourism. “I would not be able to achieve anything if I had not built a network of professional and reliable partners. Tourism is visibility and the ability of being what destinations say they are” St.Ange said in Ghana. He discussed the exciting and timely stage Africa finds itself in with many from different approaches all re-writing the narrative for Brand Africa. For Uganda they discussed existing challenges and touched on what could or should be looked at for a healthier tourism industry. Dr Wasswa Tom Davis and Alain St.Ange are expected to plan for a following meeting soon.